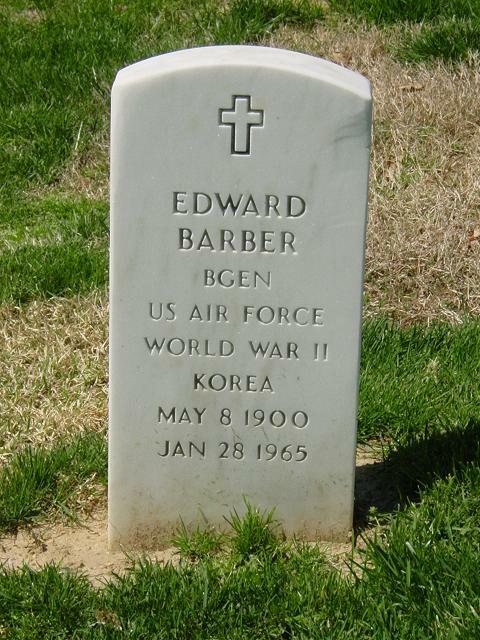 Edward Barber was born at Covington, Kentucky, in 1900. He was appointed Second Lieutenant, Coast Artillery Corps, Regular Army, August 17, 1921 with rank from August 4, 1921; accepted August 20, 1921; promoted to First Lieutenant (permanent), November 28, 1921; discharged as First Lieutenant and appointed Second Lieutenant, December 15, 1922; accepted December 15, 1922; promoted to First Lieutenant (permanent), June 10, 1926; promoted to Captain (permanent), August 24, 1935; promoted to Major (permanent), July 17, 1940; assigned service number O-14 632; appointed Lieutenant Colonel, Army of the United States, January 1, 1942 with rank from December 24, 1941; accepted January 2, 1942; promoted to Colonel (temporary), July 15, 1942; appointed Brigadier General (temporary), October 7, 1943 with rank from September 20, 1943; promoted to Lieutenant Colonel (permanent), August 4, 1944; appointment to Brigadier General terminated January 31, 1946; promoted to Colonel (temporary), February 1, 1946 with rank from June 17, 1935; transferred to Air Corps, May 1, 1947; promoted to Colonel (permanent), April 2, 1948; assigned service number 206A; retired in the grade of Colonel, Sept. 30, 1951 and advanced to the grade of Brigadier General, effective October 1, 1951. The degree of bachelor of science in electrical engineering was conferred upon him by Massachusetts Institute of Technology in 1935. He is a graduate of the Coast Artillery School, Basic Course, 1922; Coast Artillery School, Battery Officer's Course, 1930; Coast Artillery School, Advanced Engineering Course, 1931; Command and General Staff School, 1939; Army War College, 1940 and Air War College, 1948. He served as student, Coast Artillery School, Fort Monroe, Virginia, from September 1921 to June 1922; regimental adjutant and athletic officer, 51st Artillery, Coast Artillery Corps, Fort Eustis, Virginia, from July 1922 to December 1923; battery officer (ordinary garrison duties), 59th Coast Artillery, Fort Mills and later Fort Frank, Philippine Islands to April 1926; assistant to plans and training officer and personnel adjutant, Harbor Defense and 11th Coast Artillery, Fort H.G. Wright to February 1928; aide-de-camp to Brigadier General W.P. Jackson, Army Base, Boston, Massachusetts, to September 1929; student, Battery Officers' Course, Coast Artillery School, Fort Monroe, Virginia, to June 1930; student, Advanced Engineering Course, Coast Artillery School, Fort Monroe, Virginia, to February 1931; plans and training and intelligence officer, 65th Coast Artillery and later 1st Battalion, 4th Coast Artillery, Fort Amador, Canal Zone to March 1933; commander, Headquarters Battery, 2nd Coast Artillery, Fort Monroe, Virginia, to May 1934; student, Electrical Engineering Course, Massachusetts Institute of Technology to June 1935; instructor, Department of Artillery, Coast Artillery School, Fort Monroe, Virginia, to August 1938; student, Command and General Staff School (temporary duty, Operations and Training Division, O-3, War Department General Staff), Fort Leavenworth, Kansas, to June 1939; student, Army War College, Washington, D.C. to June 1940; assistant executive officer, Personnel Division, O-1, War Department General Staff, Washington, D.C., to November 1941; assistant to the assistant chief of staff, O-1, Planning Section, Army War College, Washington, D.C., to December 1942; commanding officer, 35th Anti-Aircraft Artillery Group, 36th Anti-Aircraft Artillery Group and later commanding general, 59th Anti-Aircraft Artillery Brigade, Camp Haan, California, to January 1945; commanding officer, 59th Anti-Aircraft Artillery, Southwest Pacific Area to October 1945; patient, Walter Reed General Hospital, Washington, D.C. to January 1946; professor of military science, Air War College, Maxwell Field, Alabama, to June 1948; deputy commandant, Air War College, Maxwell Air Force Base, Alabama, to April 1949; military intelligence officer, Deputy Division, Deputy Chief of Supplemental Research Branch, Headquarters, U.S. Air Force, Washington, D.C. to February 1951; intelligence officer, Central Control Group, Central Intelligence Agency and later intelligence officer 1007th Air Intelligence Service Squadron, Washington, D.C. to September 1951. He had active duty as a commissioned officer from August 20, 1921 to September 30, 1951, date of his retirement. General Barber was awarded the Asiatic-Pacific Campaign Medal with star for participation in Marianas Campaign World War II Victory Medal; American Defense Service Medal; American Theater Ribbon; Commendation Medal; Meritorious Service Unit Plaque; War Department General Staff Badge; Bronze Star Medal, for meritorious service in the Western Pacific Area from February to September 1945. As commanding general, 59th Anti-Aircraft Artillery Brigade on Saipan, he materially aided in "mopping up" operations on this island and in training his troops for the projected invasion of Japan. Born in Covington, Kentucky on May 8, 1900. Attended the University of Cincinnati. Commissioned in the Coast Artillery Corps in 1921. Graduated from Command and General Staff School in 1939 and the Army War College in 1940. With the War Department General Staff July 1940-November 1941, the Army War College staff November 1941-February 1942 and Army Ground Forces February 1942-February 1943. Brigadier General in September 1943. Commanded the 59th Antiaircraft Artillery Brigade 1943-1945. Assignments after the war included Deputy Commandant of the Air War College 1948-1949. Retired in September 1951. Decorations included the Bronze Star and Commendation Ribbon.